homeschoolers? As a long term homeschooler, let me set the record straight. If you have family members who are livid you’re homeschooling, giving the kids a standardized test can ease some of the angst. You can honestly say you’re testing the kids every year and they’re doing just fine. And you can stop questioning your decision to homeschool. Done yearly, standardized testing allows you to view the change and growth from year to year. It’s like a yearly snapshot. You see what subjects are improving, which subjects need work, and if your child is improving or struggling in their schoolwork. My kids love comparing scores from year to year and seeing their improvement. Occasionally a child’s score will come back in the abysmal range. We’re talking bottom of the heap, how could my child score this low, type range. An abysmal score doesn’t mean you’re a bad teacher. he test simply revealed an undiagnosed learning issue. It’s time to search for answers. Homeschooled children will need to take standardized tests such as the PSAT, SAT, and ACT in high school to meet college entrance requirements. Taking standardized tests at a young age gives kids excellent practice with test taking. They learn how to fill in the bubble sheet and see what the format of the test is like. Working one-on-one with your child gives you a good idea of your child’s strengths and weaknesses. Do you really need a test to tell you they’re struggling with spelling or don’t know their multiplication facts? Probably not. In my years of testing I found it confirmed what I already knew. Standardized testing is time consuming. It takes up valuable time which could be spent on learning. Think about it. Instead of learning about insects, elephants, or the weather, kids spend a couple of days filling out bubbles. Standardized tests are not your best use of time. Standardized testing is hard on younger children. Instead of running around playing and exploring, they’re sitting still and filling out bubbles. Many wiggly kids have trouble focusing for 15 to 20 minutes on just spelling, just reading, or just math. In addition they’re too young to learn the test-taking strategies older children master. High scores may not seem like much of a con, but I’ve known parents who skipped entire grades of homeschooling based on standardized test scores. The test gives kids, say 5th grade material, and compares your child to how the average 5th grader scored. BUT the test gives a grade equivalency score. You may find your child tested at the 9th grade level. This does not mean your child is ready for the 9th grade! It merely means that given 5th grade material, the average 9th grader would score as well as your child did. Just because your child has mastered 5th grade material does not mean your kid is ready for high school. The high score means you’re doing a fabulous job. Pat yourself on the back and stay on course. Choosing whether or not to give the kids a standardized test is a personal decision and one each family needs to make for themselves. 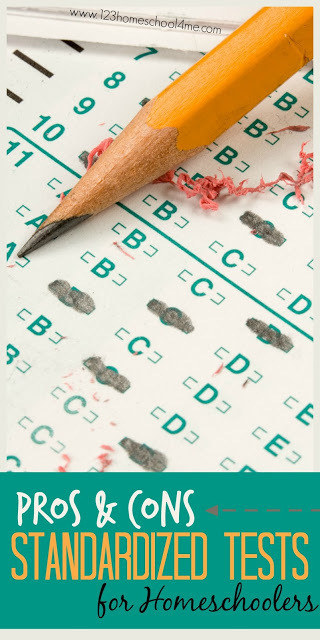 Weigh the pros and cons and let me know, do you give your children a standardized test? Is a Boxed Homeschool Curriclum Right for You?